Easily clean cars, stairs, upholstery, barefloors, rugs, and many more quick messes in the palm of your hand . The exclusive Riser Visor® flips to easily clean upholstery and stairs vertically or horizontally. 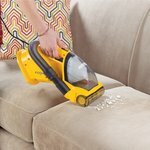 On/off brushroll picks up dirt from bare floors and area rugs. Formerly named Quick-Up. Popular Consumer Magazine "Small vacuums. 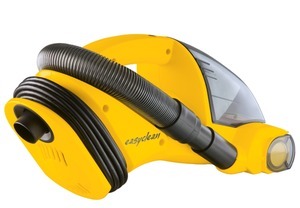 Looking for a compact vacuum that can tackle light jobs without a heavy racket? 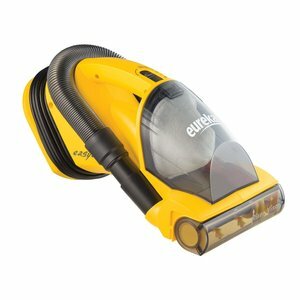 The Eureka Easy Clean 71B hand vacuum, $50, is the quietest of our picks, with superb pickup on the bare floors that typically define hand-vacuum cleaning. Impressive pet-hair pickup is part of that 5.5-pound package, though carpet cleaning—while okay—was a notch below our other top picks. Stick vacuums save you some bending and hands-and-knees maneuvers. The Hoover Platinum LiNX BH50010, $160, topped our scores overall, whisked away surface dirt and pet hair from carpets, and proved as quiet as the Eureka." 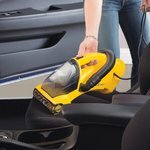 Lightweight and portable—weighs less than 5 pounds—to easily get into spaces where dirt and allergens linger. Exclusive Riser Visor™—flips to easily clean upholstery and stairs vertically or horizontally. Switch from bare floor to area rugs to pick up dirt and allergens. Turn brushroll on for carpets and off for bare floors to pick up dust, allergens and pet hair from all floor types. Empty the dust cup quickly and easily without the mess. The 20 foot cord covers more area for a quicker clean. Clean hard-to-reach areas with the crevice tool. Utilizes soft materials in the grip to make the cleaning experience comfortable during use. Filter Captures dust, dirt and other small particles for a cleaner home. The Exclusive Riser Visor™—flips to easily clean upholstery and stairs vertically or horizontally. Very efficient, quick shipping,product exactly as described. AllBrands.com is an independent dealer not associated with Consumer Reports.